SN 2012au was already known to be extraordinary – and weird – in many ways. Although the explosion wasn’t bright enough to be termed a “superluminous” supernova, it was extremely energetic and long-lasting, and dimmed in a similarly slow light curve. Saturn’s largest moon Titan as seen by the Cassini spacecraft. This world’s liquid methane and ethane rivers, lakes and seas might support some kind of life, and scientists now think they know the best places to look. Image via NASA/JPL-Caltech. NASA’s Cassini spacecraft and ESA’s Huygens lander showed that Saturn’s large moon Titan mimics Earth in many ways. But Titan displays different kinds of chemistry in a far colder environment. Given the similarities, the question of life inevitably arises: could Titan support some kind of simple life? 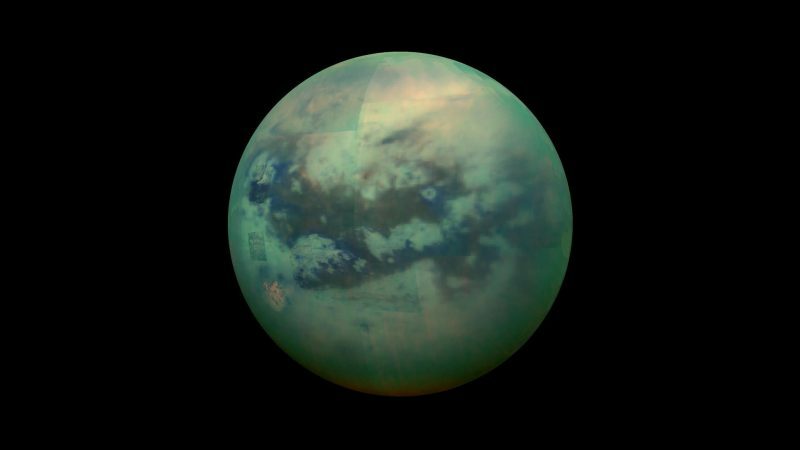 Given the differences, scientists ponder the best places to look for Titan life. In late July 2018, a new study published in the peer-reviewed journal Astrobiology and reported on in Astrobiology Magazine suggests the best places on Titan to look for evidence of life. 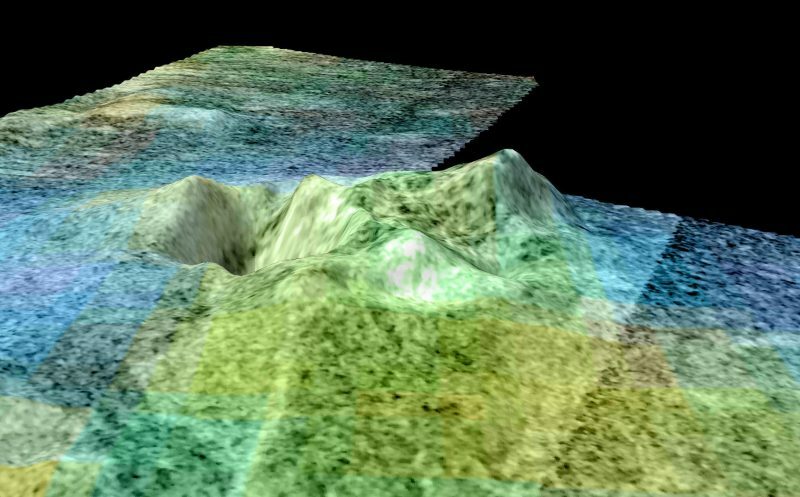 Titan is a geological wonderland for planetary scientists. It has rivers, lakes and seas of actual liquid – not water, but the hydrocarbons methane and ethane – and it has mountain ranges, possible ice volcanoes (aka cryovolcanoes) and vast hydrocarbon dunes. There is also evidence for a subsurface ocean of water, similar to those believed to lie beneath the surface of Jupiter’s moon Europa and Saturn’s moon Enceladus. 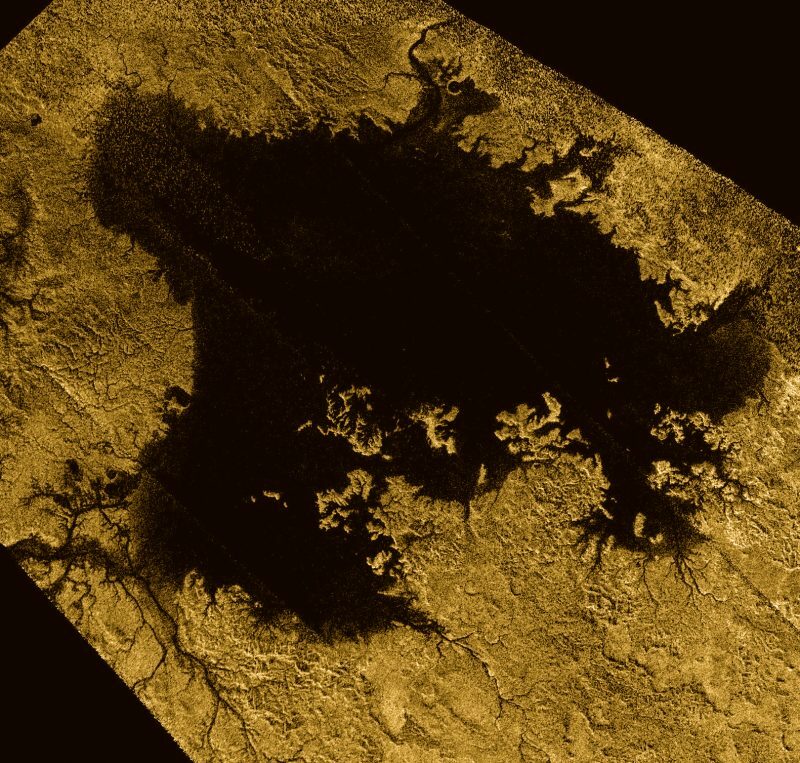 Perhaps surprisingly, the research team, led by Catherine Neish, a planetary scientist specializing in impact cratering at the University of Western Ontario, suggested that the best locations to look for life on Titan would not be the lakes or seas. Instead, the new work shows a better place to look would be within impact craters and cryovolcanoes on Titan. The scientists reason that these areas are where water ice in Titan’s crust could temporarily melt into a liquid. Water is still the only solvent known to be able to support life as we know it. 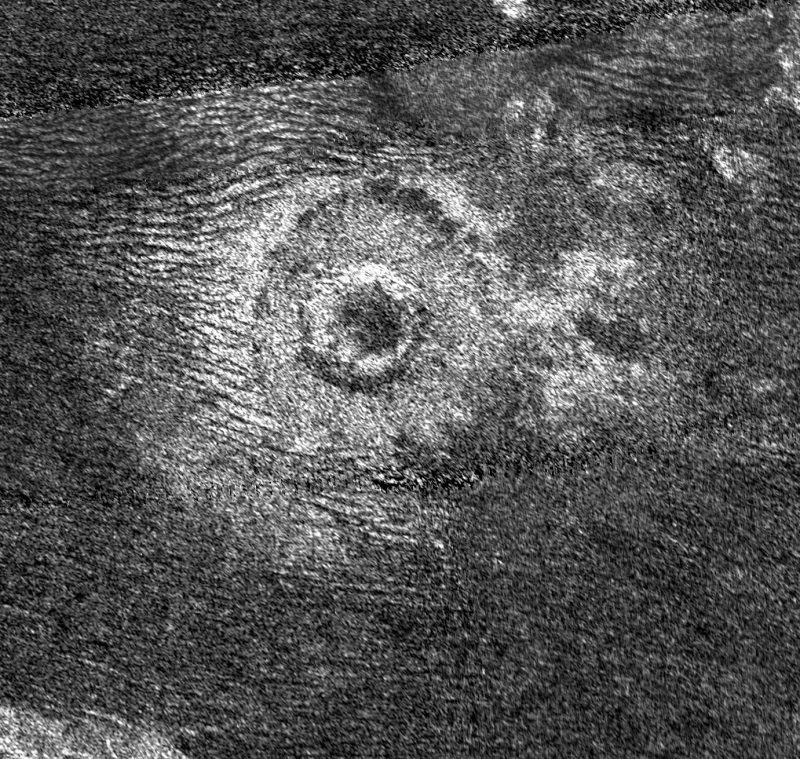 A large, fairly young crater on Titan, about 25 miles (40 km) in diameter. Such craters could temporarily melt frozen water in the crust, providing an environment for pre-biotic or biotic molecules to form. Image via NASA/JPL-Caltech. Various studies have suggested that liquid methane and ethane could support life. But Saturn’s moon Titan – some nine astronomical units farther from the sun than Earth – is very cold, with surface temperatures hovering around -300 degrees Fahrenheit (–179 degrees Celsius). Methane and ethane do remain liquid at Titan’s surface temperature, but it’s too cold there for biochemical processes, at least as far as we know (although that, too, is a matter of debate). The temperatures on Titan’s surface are too cold for liquid water, so where could it be found? The answer is Titan’s craters and cryovolcanoes. The processes involved with both of these geologic features can melt water ice into liquid, even if only temporarily. But that might be enough for more complex organic molecules like amino acids to form. 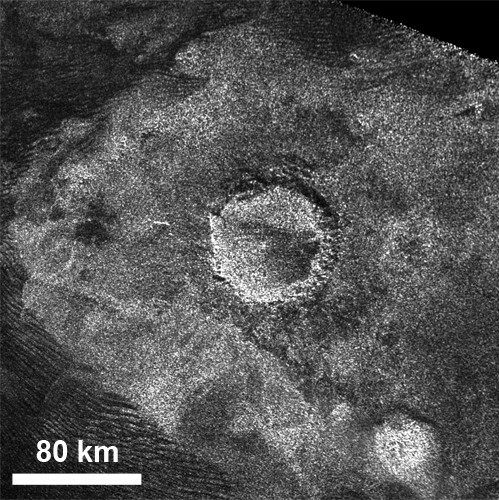 Sotra Facula is a possible cryovolcano on Titan, one of the few candidates known. Image via NASA/JPL–Caltech/USGS/University of Arizona. Another view of Sotra Facula. This image was built from radar topography with infrared colors overlaid on top. Image via NASA/JPL–Caltech/USGS/University of Arizona. Warmer water would allow for faster chemical reaction rates, which would help in the creation of prebiotic or even biotic molecules. The largest known craters on Titan are Sinlap (70 miles/112 kms in diameter), Selk (56 miles/90 kms) and Menrva (244 miles/392 kms). These would be the primary locations to look for biomolecules. Titan is well-known for its lakes and seas of liquid methane/ethane, such as Ligiea Mare, shown here. Image via NASA/JPL-Caltech/ASI/Cornell. 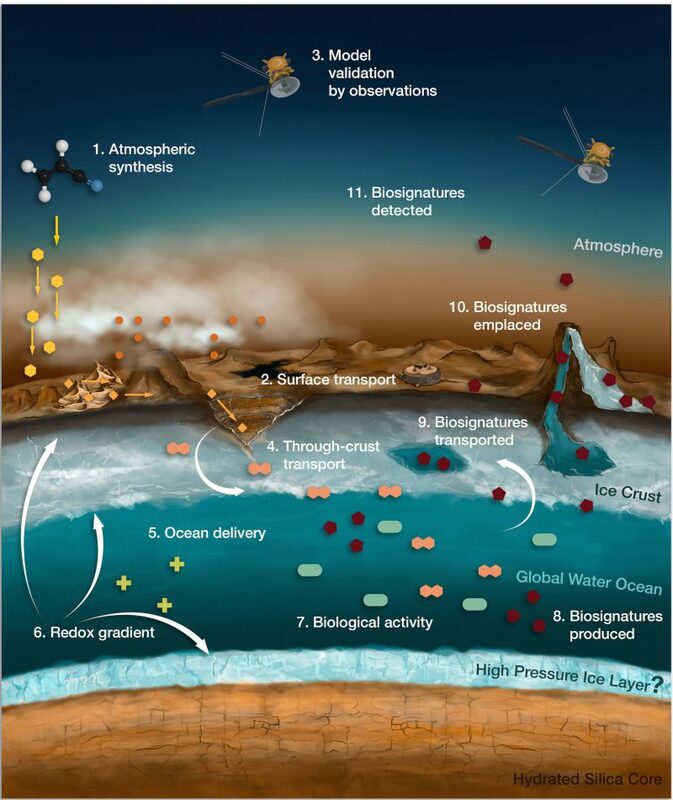 Diagram illustrating how biosignatures could also be transported from the subsurface ocean to the surface of Titan. Image via Athanasios Karagiotas/Theoni Shalamberidze. There is also, of course, a possible subsurface ocean of water on Titan, but, if it exists, it is deep below the moon’s surface and inaccessible to any robotic probes in the near future. 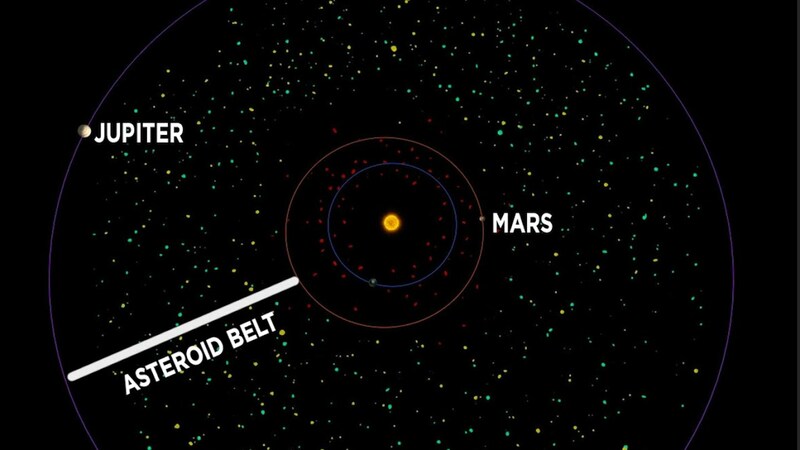 For now, we can only imagine what might be in that alien abyss. The methane/ethane lakes and seas should still be explored too; they are the only other known bodies of liquid on the surface of another moon or planet in the solar system. Methane-based life could theoretically exist in such environments, so it would obviously be a good idea to look, at least. Bottom line: Titan is a world that is eerily similar to Earth in some ways, yet still uniquely alien. Whether it supports any kind of life is still a big question, but researchers now think they know the best places to search for it. 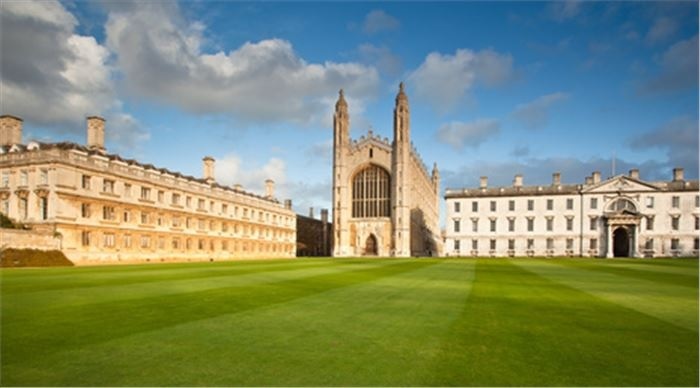 New research, published in the journal Proceedings of the National Academy of Sciences USA, indicates that these events actually occurred a hundred million years earlier, changing perceptions of the evolution of the Earth’s biosphere. Moores says though Pluto’s environment is very different from Earth’s — it is much colder, the air much thinner, the sun much dimmer and the snow and ice on the surface are made from methane and nitrogen instead of water — the same laws of nature apply. He adds that both NASA and APL were instrumental in the collaboration that led to this new finding; both provided background information on Pluto’s atmosphere using a model similar to what meteorologists use to forecast weather on Earth. This was one of the key ingredients in Moores’ own models of the penitentes, without which this discovery would not have been made.